The Traser Officer Pro Chronograph series is a no nonsense field watch look but with added functionality of a stop watch and rotating bezel. The Officers Pro Chronograph features a solid stainless steel case and sapphire crystal making this series even more durable than the original Officers Pro series. This model features a Nato style nylon band. 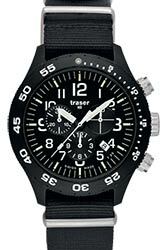 And like all Traser watches you'll be able to see the watch day or night, in any condition.